If you're the sort of IT professional who prefers to actively manage their career rather than just accept what comes along then chances are that deciding to blog could be one of the best career decisions you ever make. 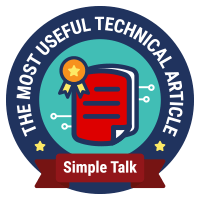 Technical blogging is a great focal point for all your learning efforts, a lasting way to give back to the community, a showcase for your talents to potential employers and a great way to make contact with other people in your field. Undecided? Seems most people initially feel that way. Try reading this, this and this. If you do decide to make the leap one of the best sources of inspiration that I have found is John Sonmez's Free Blogging Course. It's packed full of tips on how to get started and keep going and since there is nothing to lose I wholeheartedly recommend signing up. This is just the beginning though, and it turns out that this is the start of many practical decisions you will need to make in order to turn out good quality blog posts that reach as wide an audience as possible. I thought I'd document my experience here to give anyone just starting out a flavour of what's involved. Once you have decided to blog the first question is likely to be which blogging platform to go for. The top hits for a best blogging platform Google search invariably recommend WordPress and since there seemed no point in ignoring the very advice I had sought that's what I chose. There's more to it than that though since there is a choice of WordPress.com and WordPress.org. The former allows you to host a blog for free at WordPress.com however there are some restrictions on customisation and complications with domain name. WordPress.org on the other hand is a software package that anyone can host and is the full customisable version. If you are an IT professional you are almost certainly going to want all the flexibility and despite the fact that modest costs are involved for me WordPress.org was the clear winner. Next up is where are you going to host WordPress? With super fast broadband and technical skills some people might choose to host themselves at home but on my rural 1.8 Mbps connection that wasn't an option. I started down the Microsoft Azure route and actually got a working WordPress up-an-running with my own private Azure account. Whilst I would have enjoyed the flexibility it would have given me I decided that cost was prohibitive as I wanted a PaaS solution which means paying for the Azure Website and a hosted MySQL database. It might be cheaper now so don't discount this option if Azure appeals, however I found the costs of a web hosting company to be much more reasonable. There are lots of these and I chose one off the back of a computer magazine review. Obviously you need a company that hosts WordPress at a price you are happy to pay and which offers the level of support you need. If you are looking to build a brand and market yourself then your domain name will be pretty important. It could be an amusing twist on your view or niche in the technology world or perhaps your name if it's interesting enough (mine isn't). My core interest is in the technology and processes around deploying software so pleasereleaseme tickled my fancy although I know the reference doesn't make sense to every culture. As if choosing a second-level domain name is hard enough you also need to choose the top-level. Of course to some extent your choice might be limited by what's available, what makes sense or how much you're willing to pay. I chose .net since I have a background as a Microsoft.NET developer. Go figure! I'm assuming that most people reading this blog post are technically minded and so I'm not going to go through the process of getting your WordPress site and domain name up-and-running, and in any case it will vary according to who you choose as a host. It's worth noting though that some companies might do some unwanted low-level configuration to the ‘template' used to create your WordPress site and if you need to reverse any of that you may need to use an FTP tool such as FileZilla to assist with the file editing process. In my case I found I couldn't edit themes and it turned out I need to make a change to wp-config (which lives in the file system) to turn this on. With your site now live I recommend taking some time to familiarise yourself with WordPress and go through all the out-of-the-box configuration settings before you start installing any plugins. In particular Settings > General and Settings > Permalinks are two areas to check before you start writing posts. In the former don't forget to set your Site Title and a catchy Tagline. Permalinks in particular is very important for ensuring search engine friendliness. See here for more details but the take home seems to be to use Post name. One of the bigger decisions you'll need to make is which theme to go for (Appearance > Themes). There's oodles of choice but do choose carefully as your theme will say a lot about your blog. If you find a free one then great however there is a cottage industry in paid-for themes if you can't. I'm not at all a flashy type of person so my theme is one of muted tones. It's not perfect but for free who can argue? One day I will probably ask if the author can make some changes for appropriate remuneration. In the meantime I use Appearance > Edit CSS (see Jetpack below) to make a few tweaks to my site after the theme stylesheet has been processed. In addition to displaying your pages and posts WordPress can also display Widgets which appear to the right of your main content. I change widgets around every so often but as a minimum always have a Text widget with some details about me, widgets from Jetpack (see below) so people can follow me via Twitter, email and RSS, and also the Tag Cloud widget. There's still a little more to do before you begin writing posts but this probably is a good point to start planning how you will use posts and pages and categories and tags. At the risk of stating the obvious posts are associated with a publish date whilst pages are not. Consequently pages are great for static content and posts for, er, posts. The purpose of categories and tags is perhaps slightly less obvious. The best explanation I have come across is that categories are akin to the table of contents in a book and tags are akin to the index. The way I put all this together is by having themes for my posts. Some themes are tightly coupled for example my Continuous Delivery with TFS soup-to-nuts series of posts, or less so for example my Getting Started series. I use categories to organise my themes and I also use pages as index pages for each category. It's a bit of extra maintenance but useful to be able to link back to them. Using tags then becomes straightforward and I have a different tag for each technology I write about and posts will often have several tags. Please do get a backup strategy in place before you sink too much effort in to configuring your site and writing posts. It's probably not enough to rely on your web hosting provider's arrangements and I thoroughly recommend implementing your own supplementary backup plan. There are plenty of plugins that will manage backup for you -- some free and some paid. To cut a long research story short I use BackUpWordPress which is free if all you want to do is backup to your web space. You don't of course -- you want to copy your backups to an offline location. For this I use their BackUpWordPress To Google Drive extension which costs USD 24 per year. It does what it ways on the tin and there are other flavours. Please don't skimp on backup and getting your backups to an offsite location! If you have comments turned on (and you probably should to get feedback and make connections with people who are interested in your posts) you will get a gazillion spam comments. As far as I can see the Akismet plugin is the way to go here. Don't forget to regularly clean out your spam (Comments > Spam). Your instinct will probably be to want to go through spam manually the first few times you clean it out but Akismet is so good that I don't bother any more and just use the Empty Spam button. This is one of those topics that is huge and makes my head hurt. In short it's all about trying to make sure your posts are ranked highly by the search engines when someone performs a search. For the long story I recommend reading some of the SEO guides that are out there -- I found this guide by Yoast in particular to be very useful. To help cope with the complexities there are several plugins that can manage SEO for you. I ended up choosing the free version of WordPress SEO by Yoast since the plugin and the guide complement each other. There is some initial one-time setup to perform such as registering with the Google and Bing webmaster tools and verifying your site and submitting an XML sitemap , after which it's a case of making sure each post is as optimised for SEO as it can be. The plugin guides you through everything and there is a paid-for version if you need more. In order to understand who is visiting your site you will want to sign up for a Google Analytics account. You then need to insert the code in to every page on your site and as you would expect a plugin can do this for you. There's a few to choose from and I went for Google Analytics Dashboard for WP. Although blogging is about words a picture can apparently paint a thousand of them and as a technical blogger you are undoubtedly going to want to include screenshots of applications in your posts. I spent quite some time researching this but ultimately decided to go with one of Scott Hanselman's recommendations and chose WinSnap. It's a paid for offering but you can use it on as many machines as you need and it's very feature-rich. I do most of my work via remote desktop connections and pretty much all of the time use WinSnap from an instance installed on my host PC. I do have it installed on the main machine I remote to but making it work to capture menu fly-outs and so on directly on the remote machine is a work in progress. Whichever tool you choose please do try to take quality screenshots -- Scott has a guide here. I frequently find that my mouse is in the screenshot or that I've picked up some background at the edge of a portion of a dialog. I always discard these and start again. Don't forget to protect any personal data, licence keys and the like. If you are bloggging about a technology that involves programming code you'll soon realise that the built-in WordPress feature for displaying code is lacking and that you need something better. As always there are several plugins that can come to the rescue -- here is just one review. I tried a couple and decided that Crayon Syntax Highlighter was the one for me. Whichever plugin you choose do take some time to understand all the options and do some experimenting to ensure your readers get the best experience. Try not to let spelling mistakes to slip through. Browsers have spell checkers and highlighting these days -- do use them. Proofread your posts before publishing -- and after. I'm forever writing form when I mean from and spell checkers don't catch this. WordPress has a preview feature and Jetpack has a Proofreading module -- why not try it out? Try to adopt a consistent formatting style that uses white space and headings. Watch out for any extra white space that might creep in between paragraphs. Use the Text pane of the editor to check the HTML if necessary. Watch out for extra spaces at the start of paragraphs (they creep in somehow) and also for double spaces. If you are unsure about a word, phrase or piece of grammar Google for it to find out how it should be used or how others have used it, but only trust a reputable source or common consensus. If I have any nagging doubt I never assume I am right and will always check. I've been surprised more than a few times to find out that what I thought was correct usage was wrong. Technical writing can be quite difficult because you need to refer to elements of an application as you describe how to do something, and you need to distinguish these from the other words in your sentences. I use bold to flag up the actions a reader needs to take if they are ‘following along at home' and usually also at the first mention of a core technology component and the like. have a look at some of my posts to see what I mean. In my first career as a research scientist my writing (for academic journals for example) was strictly in the third person and quite formal. That doesn't work at all well for blogs where you want to write directly to the user. For most ‘how-to' blogs second person is probably best with a bit of first person thrown in on occasions and that's the style I use. Have a look here for more explanation. If you are serous about improving your written work there are plenty of books and web pages you can read. Many years ago when I was an undergraduate at the University of Wales, Bangor, there was an amazing guide to writing called The Style and Presentation of Written Work by Agricultural and Forest Sciences lecturer Colin Price. I read it over and over again and it still stands me in good stead today. My paper copy has long since vanished but I was thrilled to find it available here. The focus is on academic writing but it's packed full of useful tips for everyone and well worth reading. So, your blog is up-and-running and you are putting great effort in to writing quality posts that you are hoping will be of use to others in your area. Initially you might be happy with the trickle of users finding your site but then you'll write a post that takes over 10 hours of research and writing and you'll wish you had more traffic for your efforts. Answering questions on MSDN forums and StackOverflow. Create and maintain your profiles on these forums and when answering questions link to one of your blog posts if it's genuinely helpful. Answering questions is also a great way to understand where others are having problems and where a timely blog post might help. Comment on other bloggers' posts. I follow about 70 blogs and several times a week there might be an opportunity to comment and link back to a post you have written. Link to the CodeProject if you are writing a blog that fits that site -- instructions on how to link here. Once connected the quick way to have a post consumed is to have a WordPress category called CodeProject and use it in the post. Use Jetpack's Publicize module to automatically post your blogs to Twitter, Facebook and LinkedIn and Google+. I'm still working out the value of doing this -- my family are bemused -- but it's automatic so what the heck? In all seriousness if you are looking to promote your blog in a big way then social media is probably going to be a big thing for you. That's pretty much where I have got to on my blogging with WordPress journey to date. Looking back it's been a huge enjoyment getting all this configured and sorted out. Concepts that were once very hazy are now a little less so and I have learned a huge amount. I'm sure I've missed lots of important bits out and maybe you have your own thoughts as to which plugins are must-haves. Do share through the comments!